Young rally driver Tom Cave will step his 2012 rally campaign up a gear next weekend, when he tackles the Bulldog Rally, his 'home' round of the British Rally Championship in his brand new Citroen DS3 R3 rally car. Not only will the youngster, partnered by Craig Parry, be looking for a solid points haul for the BRC, he will also be looking for success in the newly-announced Citroen Racing Trophy, the one-make series offering significant prizes. Tom drove a rented Ford Fiesta R2 on the BRC season-opener, the Sunseeker Rallye in February as his Citroen hadn't even landed in the UK by the time the event began. However, the car is now here, has been converted from tarmac to gravel specification by DMS, had its livery applied and is ready for the pre-event test that Tom will be carrying out on the Tuesday of rally week. While Tom has yet to drive the DS3, he is deliberately leaving the test to just before the event, so that he arrives in the car fresh and can immediately take everything he learns forward to the event. The Citroen Racing Trophy takes place over all six rounds of the BRC and offers drivers not only the chance of a genuine championship but also, significant prize money. First place overall for a driver of a Citroen DS3 R3 on each event wins €6000, second is worth €3500 and third, €1500. At the end of the season, the winning Trophy driver under 23 gets €10,000 towards an entry into the Rallye du Var while the winner over 23 claims an additional €5000. 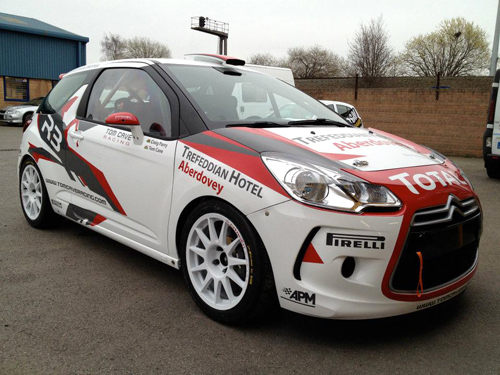 Commenting, Toms said; "I'm really looking forward to getting out in the Citroen. Is a very serious rally car and I'm very excited to be driving it in not only the BRC but also, the Citroen Racing Trophy. The prize money is, of course, a fantastic incentive and will definitely help our campaign if we can get some good results. "Driving the Citroen will be a fresh challenge for me as it's very different to what I'm used to but I'm really looking forward to it. We'll have a pre-event test just before the start of the rally so that it all remains as fresh as possible for when we start the first stage but I'm very excited." The Bulldog Rally is effectively Tom's home round of the BRC, since it's based in Welshpool and uses stages close to Aberdovey, home to him and sponsor, the Trefeddian Hotel. Despite this though, he doesn't have a vast amount of experience of the stages and will be starting the pre-event recce from scratch, with no existing pace notes. However, he does know that the stages will be tricky, as his 2011 event came to an abrupt halt when he went off the road on the first timed test. "That stage, the first last year, runs as the last one this year, so by the time we get to it, hopefully I will have felt my way into the car and won't have any problems. I think we'll settle in on the Friday night stage and then up the game a little on Saturday. "The plan is to target a podium finish. I think that we will look at where we are on Saturday and if we're in touch with the leaders, then we'll push for that result. We need to grab as many points as we can for the BRC standings and of course, do as well in the Trophy as we can." The event begins with the traditional ceremonial start in Welshpool centre on the evening of Friday 23 March, before two runs through the Dyfant stage in falling light. Following an overnight halt, the crews then face nine further stages on Saturday 24 March, including two runs through the gruelling 15-mile Gartheiniog test. The first crews are expected to reach the finish podium at 19.00hrs on Saturday. Rally driver Richard Sykes will continue his quest for the 2012 BRC Challenge rally championship title next weekend when he contests the Bulldog Challenge event. Stourbridge's Sykes made an excellent start to the season on the opening round of the championship, taking second place on the Rallye Sunseeker Challenge in his Bathams Brewery, G I Sykes Ltd, Boroughbridge Marina and Silverstone Tyres-supported Citroën C2 R2 Max, and he is keen to put in another good performance on the Welshpool-based round two. "The Sunseeker went really well for us, the pace at the top of the leaderboard was very quick so I was delighted to finish second," said Sykes. "My aim for this season is to take the BRC Challenge title so I need another strong result next weekend." "I'm really looking forward to the event, it uses some of the classic Welsh rally stages such as Dyfi and Gartheiniog and they are sure to provide a tough test for all the crews. With every second counting in the BRC Challenge we'll have to be fast right from the start to be in with a chance of taking a top position." Sykes will be partnered by co-driver Simon Taylor on the event which will start from Welshpool at lunchtime on Saturday. The BRC Challenge crews will face an opening loop of three stages in Dyfi and Gartheiniog forests and then three further stages in Llangywer, Penllyn and Dyfnant before heading back to Welshpool for the finish. 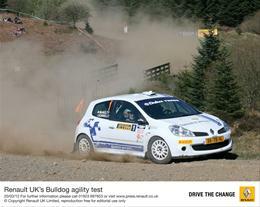 The rally will be preceded by a ceremonial start in Welshpool town centre on Friday evening. Bigger photo next time please, Renault. Renault’s first round lead came after a thrilling season opener last month in which Clio R3 crew Mark Donnelly & Dai Roberts not only took top Manufacturers’ points, but won Rallye Sunseeker International outright. 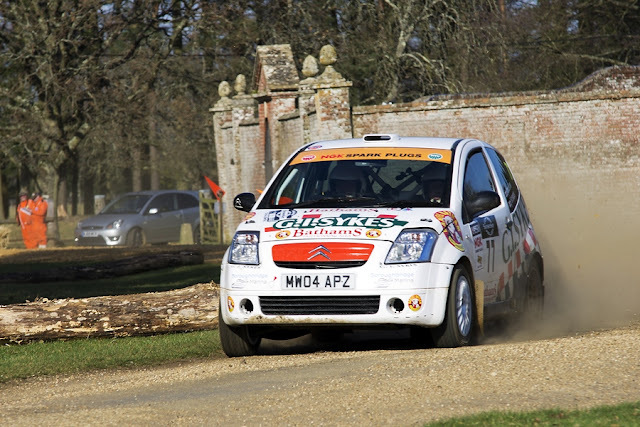 Fellow Clio driver Peter Taylor and his co-driver Andrew Roughead took fifth and with it sufficient points to grab a slender single point lead from rival marque Citroën, returning with their car in Wales. The principle of privateers scoring points for their chosen car make is an innovative one, but one that has been embraced and which fosters great competitiveness amongst the crews and manufacturers. The Ford Motor Company played a waiting game, but could not bear to miss out on the fun, signing up at the eleventh hour ahead of the opening round. Therefore, with three makes vying for the prestigious MSA title in some of the world’s most iconic forest rally stages, it will take nerve, speed and agility to hound down maximum points on this classic event. Further down the field is a trio of Twingo Renaultsport Trophy runners who will play their part too. Although they lack the outright power of the Clios, Chris Ingram/Joe Cruttenden and Nick Allen / Andy Bull could help keep the pressure on the Fiestas, while Garry Pearson / Craig Wallace will push their Class 10 car to try to keep the youngster’s MSA British Junior Rally Championship lead.